The liquid light of afternoon filled the Slate Run gorge. 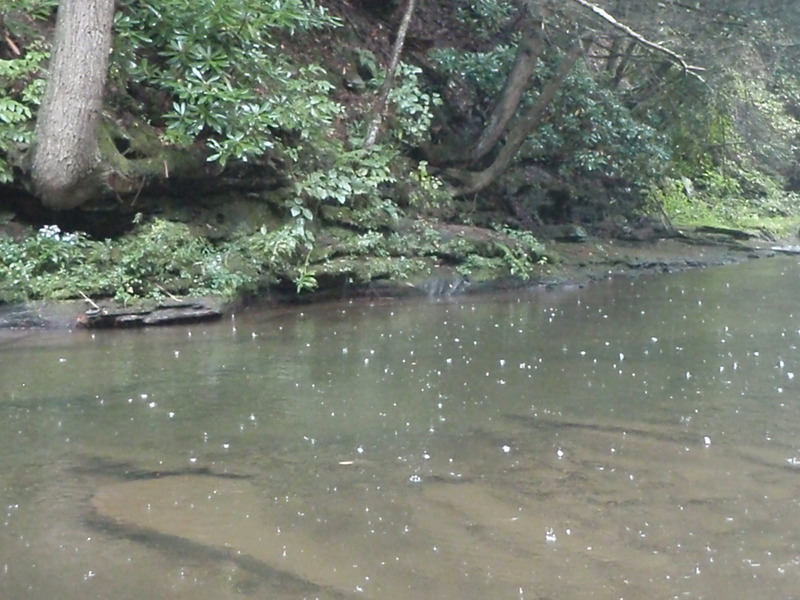 I stood there in the much needed rainfall waiting for the stream to come alive with trout and motion. Although the run remained September low, several of the pools were deep and calm. It was the season to expect some Isonychia (Slate Drake) mayfly activity, and I worked my favorite imitation of its nymphal form, a beadhead Prince, a #14. 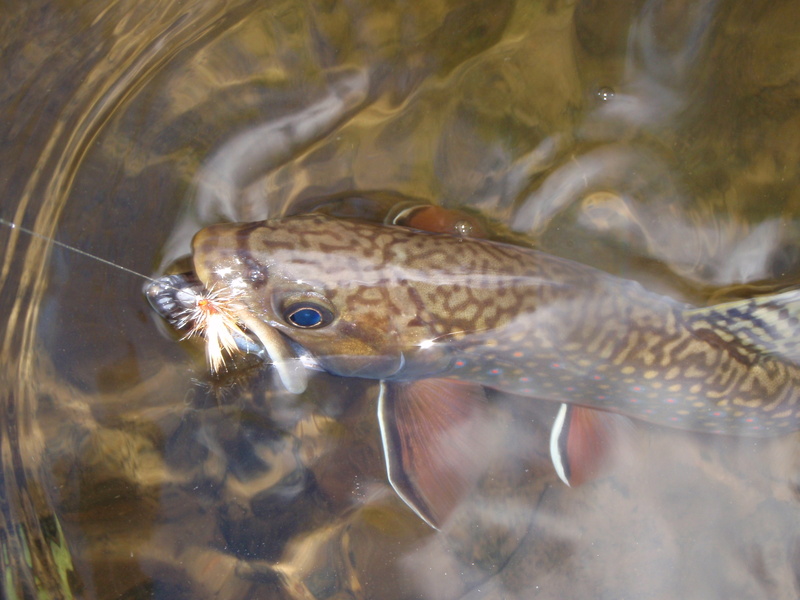 I’d caught a small brookie, but the next fish really rocked the waters underneath those dripping ledges. When the big brown came to net for several quick photos and release, I knew it was the largest I had found there in a year, or more. In the dimming light of day, I reinforced my own belief that fishing for wild trout on this pristine water was improving monthly and would soon be back to its former glory. 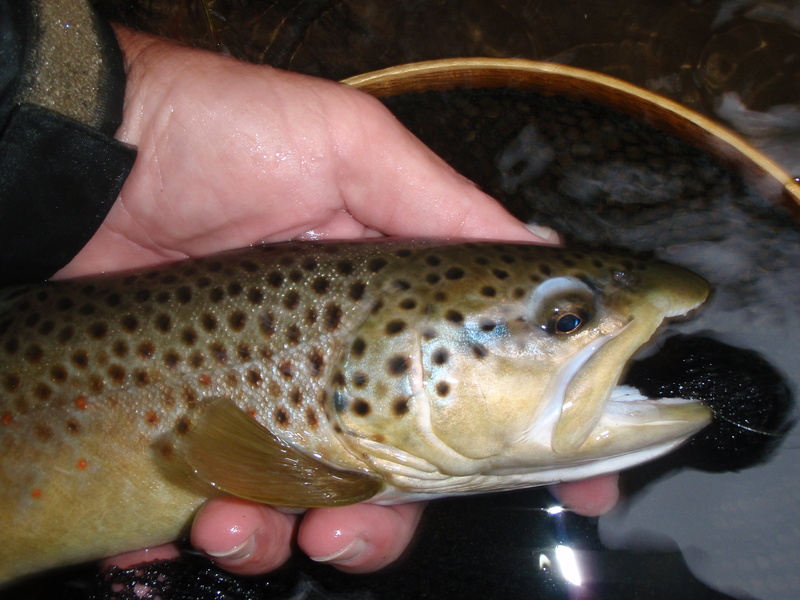 We would always need to be vigilant and work as stewards for protection of these runs, but this brown trout’s release felt like a small step toward autumn brightness. I went to check on a local headwaters stream and found a nice surprise. 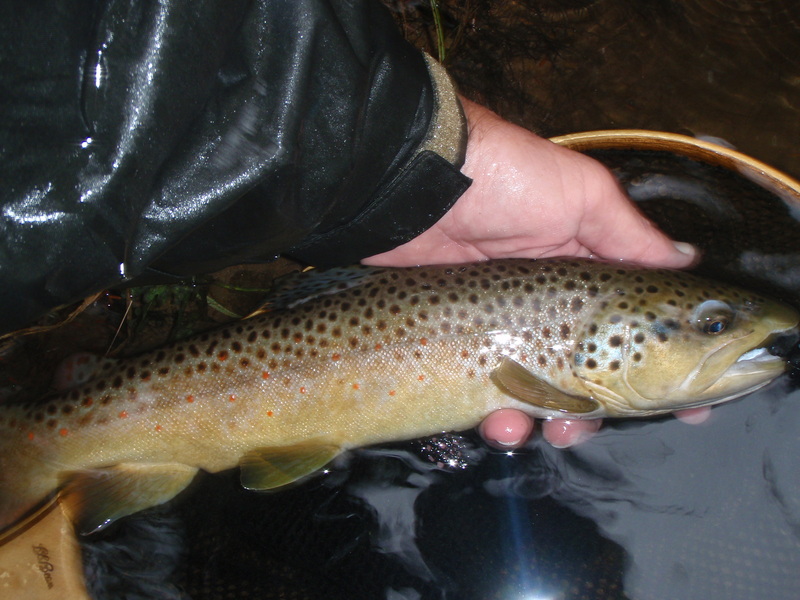 I had inched my way into a black willow pool that in years past has held some very nice brown trout, stocked or wild. Between a sunken log and the high bank of the willow lay a good-sized sucker, maybe 18 inches long. 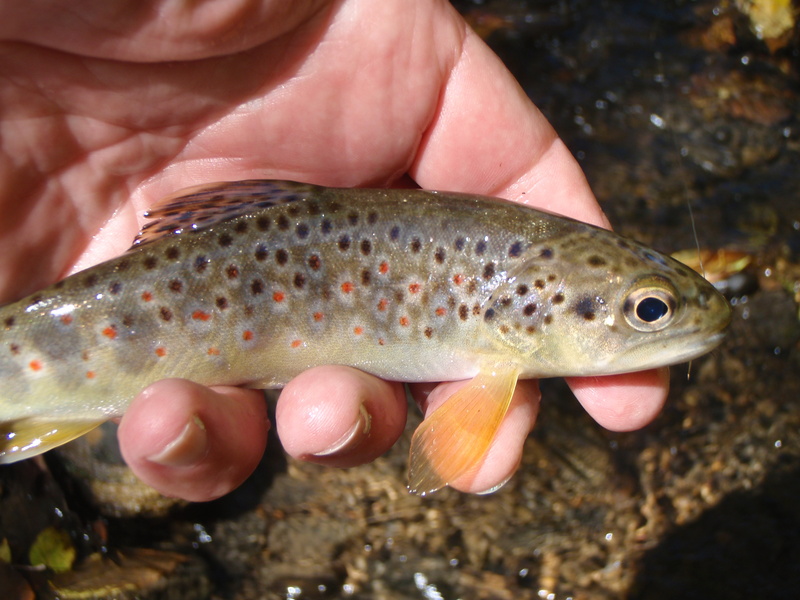 At first the sucker appeared to be lying by a short black log, but as I leaned forward, peering into the waist-deep water, I became aware that the “log” took on the profile of a trout– a big trout with a black coat of age. The image of the sucker was my entry to a vision of the Great Beyond. I quickly substituted my dry fly for a weighted nymph, but the water’s depth, the overhanging branches, and the long sunken log conspired to make this a challenge of the first degree. The fish was only six or seven feet away from me, but the work of getting the deep drift aligned with the trout’s nose wasn’t easy. In fact, it took me close to half an hour of careful roll-casting and bow-and-arrow shots to get the drift I wanted without scaring off the fish. The spidery darkness of an undercut bank was just a fin’s flash to the left. I got the drift, but only after I’d shortened the leader and tied on a weighted stonefly nymph, a #6. The white mouth opened on the stonefly and closed. I raised the rod tip sharply. There was weight on the line. There were head shakes and a whole lot of dancing as I tried to work the big brown (I’d say 25 inches, because it looked to be 27) down the pool and away from the sunken log. Sometimes we’d like to change the direction in which our story goes, but unless we’re writing fiction or telling the famous fishing lie, we seldom have the chance to influence it with more than a token gesture. We could curse ourselves for being simply human, but it seems better just to laugh or shrug it off, remembering why we bothered coming out here in the first place. The other night we got a little rain as a cold front moved in and left us with a cooler, clearer day for outdoor fun. I was on the headwaters of a favorite Potter County stream and found it to be (as expected) low and very clear. Not a great scenario for success, but with a careful step and a penchant for autumn wildness, it was good to be on the brook trout water. With a short 7-foot fly rod and a Stimulator dry fly tied to a 5x leader point, I stalked the deeper pools and riffles. There was a first flush of autumn color in the leaves; the sky shone like a powder-blue dome. The small wild brown trout and the brookies (one brightly colored male in particular) were pretty things, quick to rise, and quick to the hand that gave them their release. The day, itself, was promising. Yeah, a new season gripped the ridge tops with its yellow fingertips, and the spirit of adventure sang. 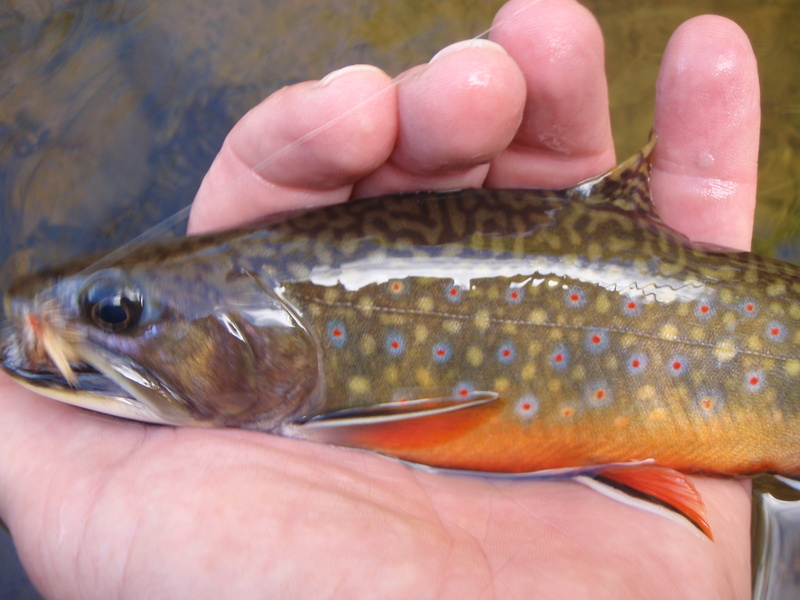 This entry was posted in Uncategorized and tagged adventure, autumn, brook trout spawning color, fly-fishing, headwaters, John Keats, nature, photography, poetry, Slate Run, trout, writing. Bookmark the permalink. Thanks much, Plaid, I always appreciate and enjoy your comments. Here’s to a great new season to you, as well. Potter County is a truly special place for fishing. The colors of the autumn foliage have nothing on S. Fontinalis. My one week in Costello was too little, but the fishing was second to none. The posting on Maine was great and I am glad you had a good time. Maybe next time you’ll come earlier or later in the season. I’m glad to have Potter as a stomping and a casting ground close to home. It’s special, indeed, and right now its foliage is still a shade of what it’s going to be in a couple of weeks– as it is in Maine, and in your terrritory. 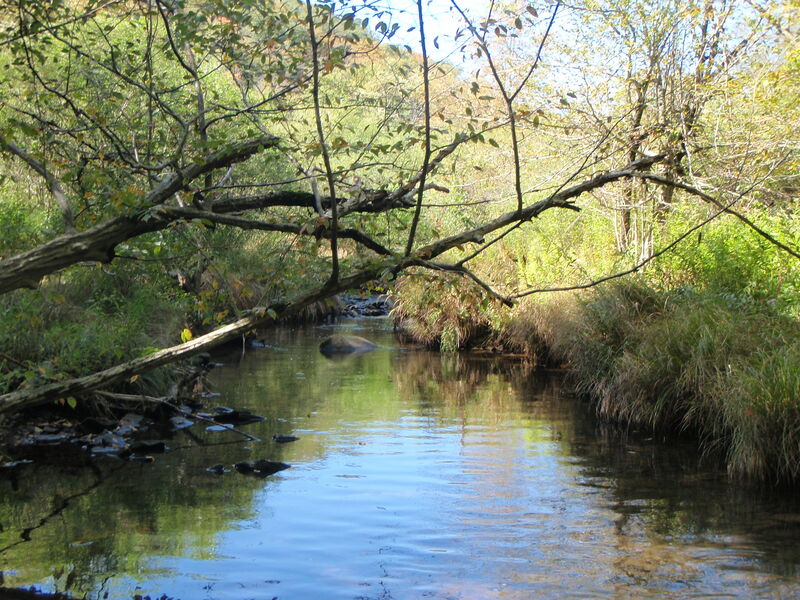 I hope to do more fishing on the Sinnemahoning this fall and next season. Let me know when you guys come back this way! And thanks for being a memorable part of my Maine experience this summer. Looking forward to an earlier visit the next time! Ah, the ones that got away…to which I say, “pleased to have made your acquaintance, if only briefly.” Beauties, Walt, all of ’em! It seems like the ones that get away are at least as beautiful as the ones that come to hand. They let imagination paint the final hues. Thanks Bob! Those beautiful little fish are sort of like the tasty little wild strawberries in the fields. What they lack in size, they make up for by standing out. Brent, Exactly. Nice comparison. It’s a sweet thing to gather those little berries, even the kind that go back to the vine! 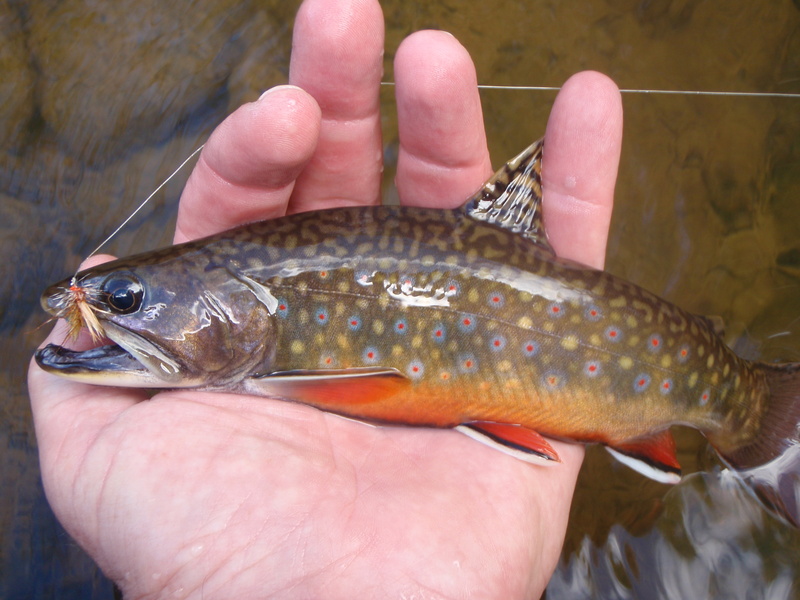 Walt – Nice to see the brook trout in your neck of the woods are starting to dress for the fall dance! Too bad about the big brown, fighting them in tight quarters is often a challenging affair to put in mildly. Hopefully we will get some needed rain down this way, it’s been so dry the leaves are falling before they had a chance to reveal their fall colors! Thanks Mark. Yeah the big browns are a challenge even when the going is clear. It’s always fun to try, though. The rain is really needed now. I, too, am seeing the foliage dropping before the color change. I had a 7’6″ 5-weight with me at the time. For my return visit to this hole, I’m thinking that the same length in a 7-weight might do the trick, but actually the problem wasn’t so much in putting the wood to this fish as it was in getting the right drift with all the overhanging branches and the long submerged log. If I used a longer rod I’d have more trouble with the branches. I think my 7-weight glass rod in the same length might be the best choice. Thanks for your question and assessment here. What a beautiful welcome to Fall! Thanks Walt. My pleasure, Howard. Have a great entry yourself! Wow, great fishing, great photos, and a greater life in it all. The memories in this early fall trip will always keep home in its beautiful place. Nice job Walt. Thanks Doug, and have a happy, creative new season! Thanks Walt. I just finished a new poetry manuscript. titled, Bleeding The Rocky River. All is well bro. All is well. Ah, excellent, Doug. I, too, have a new book coming out in a matter of days, my first new one in 5 years. Excitement. awesome buddy. I love hearing it. Walt ……”that spawnin’ robe” beautiful. Ah yes, the annual wearin’ of the robe. A great time to be at the water. Thanks, Alan.